Ok everyone. 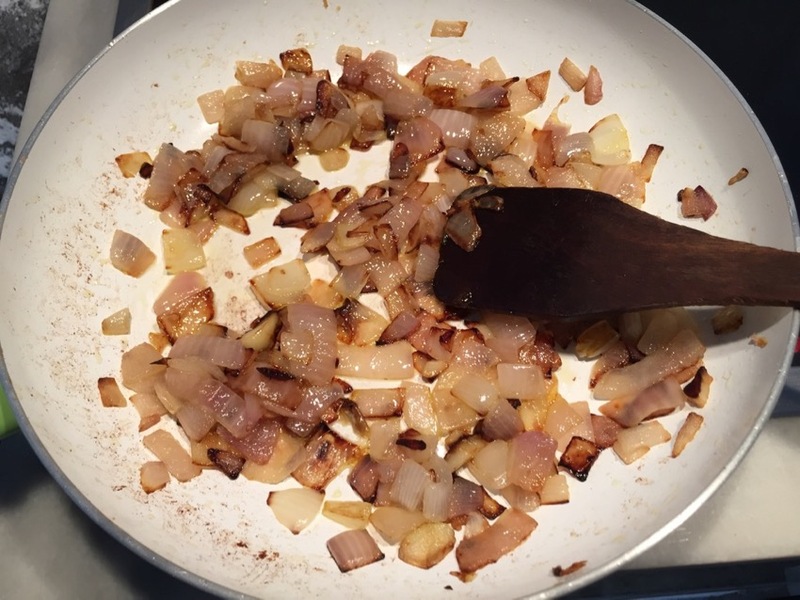 It is time for another pop-up and ad-free recipe. 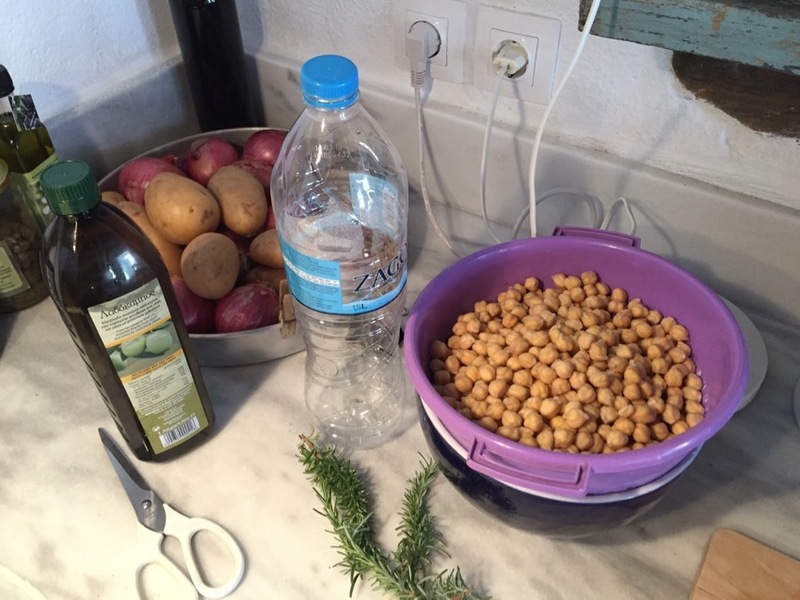 Today we are going to make Revithia, the traditional chickpea (garbanzo) stew from the island of Sifnos. For those of you who have read my Sifnos Guide this is the dish they would make every Sunday in the clay pots that the island is famous for. It is very healthy and it is totally vegetarian. 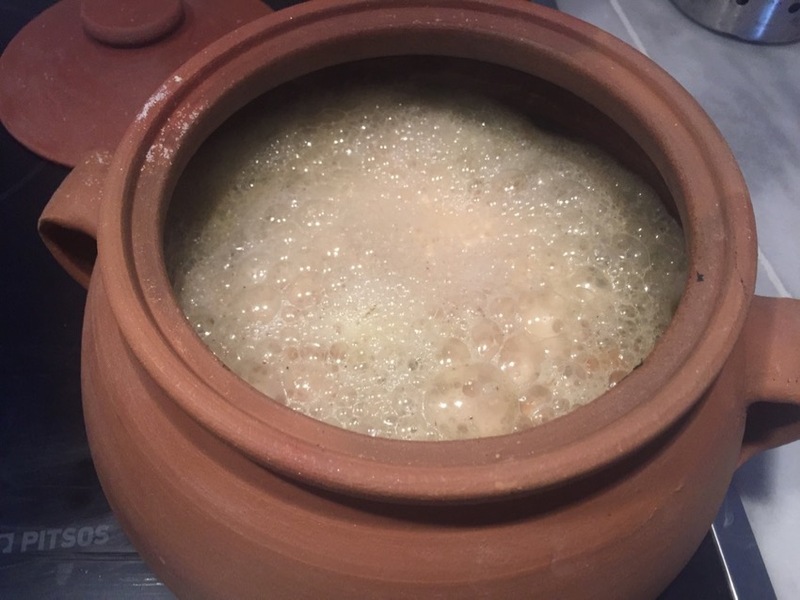 You don't need to make it in a clay pot. 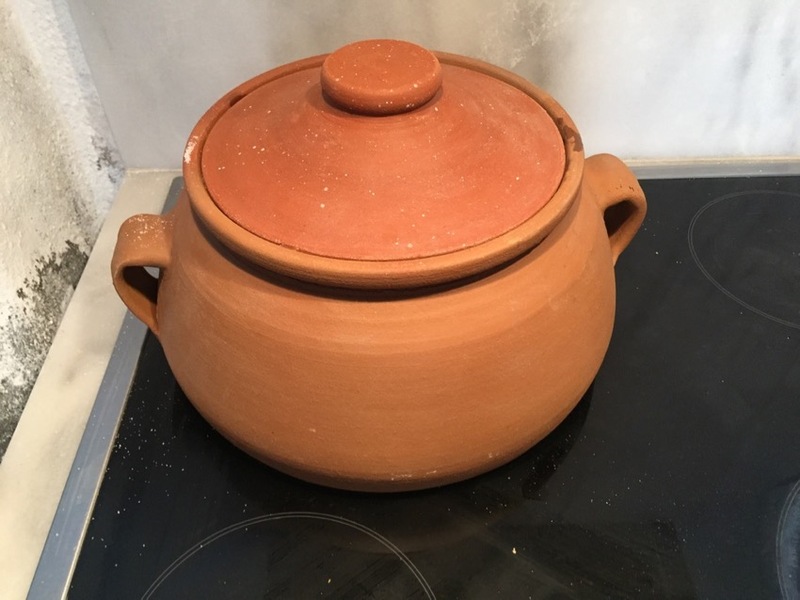 Any casserole dish with a cover is good and I even make it on a stove but because I happened to have a mastela pot from Sifnos I made it this way. 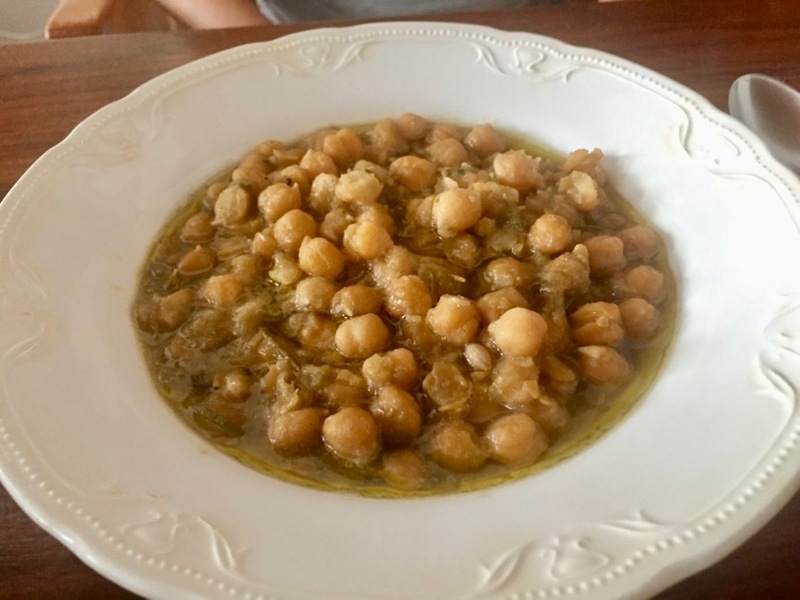 The first thing you need to do is buy some chickpeas. A pound should be enough. Put them in a pot and cover them with water plus a couple more inches and leave them overnight to re-hydrate. Check them after a few hours and if you don't see the water add more. You can then sautee the optional carrots and celery though you don't really have to. They are going to be cooked to death anyway. 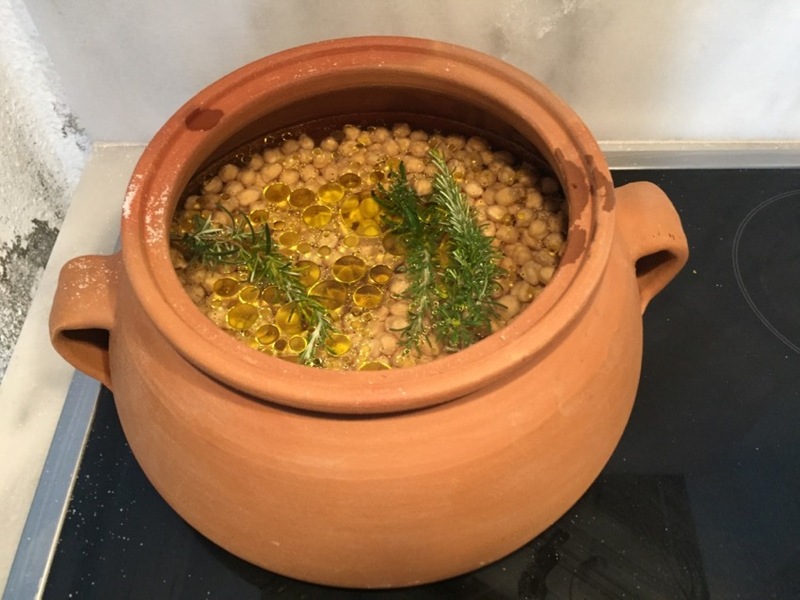 Put these vegetables and about a quarter of a cup of olive oil into the clay pot and then put your chickpeas in as well along with your rosemary, salt and pepper. Some recipes you just throw everything into the pot and don't even bother sauteing. It is not going to make that much difference in the flavor. You can also put in oregano and fresh ground pepper or whole peppercorns. I usually put in garlic powder too but use the American stuff from California, not the Chinese which has some kind of mind-control chemical in it that makes you buy their products and crave Szechuan food. 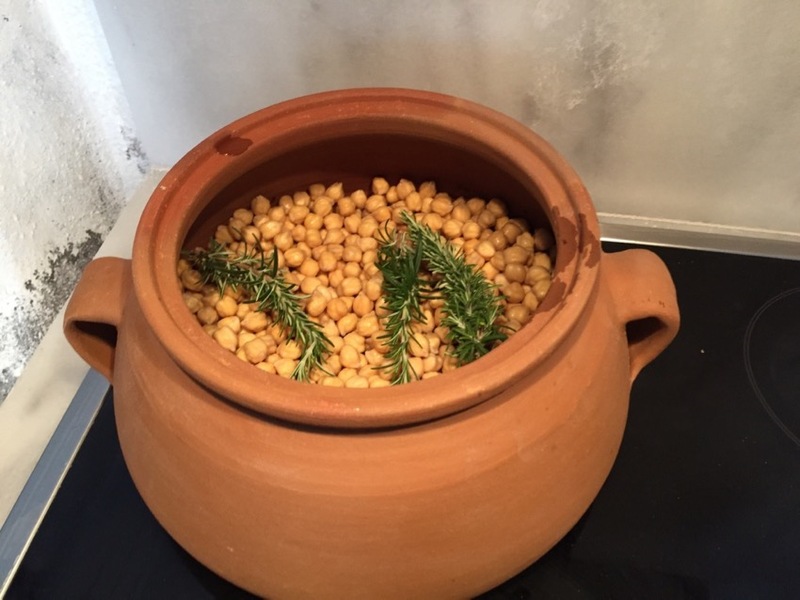 Add water to cover the chickpeas. I actually have to use bottled water because the tap water on Kea does not taste that good and after spending 3 hours making this I don't feel like throwing it away because I was too cheap to use a 50 cent bottle of water. One bottle was enough to cover them. 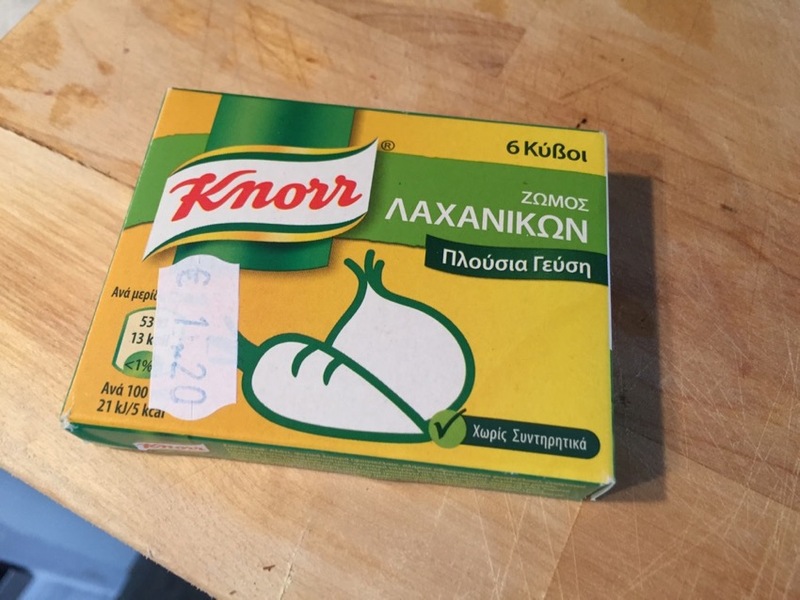 Yes this is Knorr's Vegetable Bouillon. I don't know how healthy it is but it makes anything taste better. You don't have to use it though if you have an aversion to processed food or you want to do it like the people from Sifnos did historically. Actually I have no idea if this is how the people in Sifnos make this dish or not. 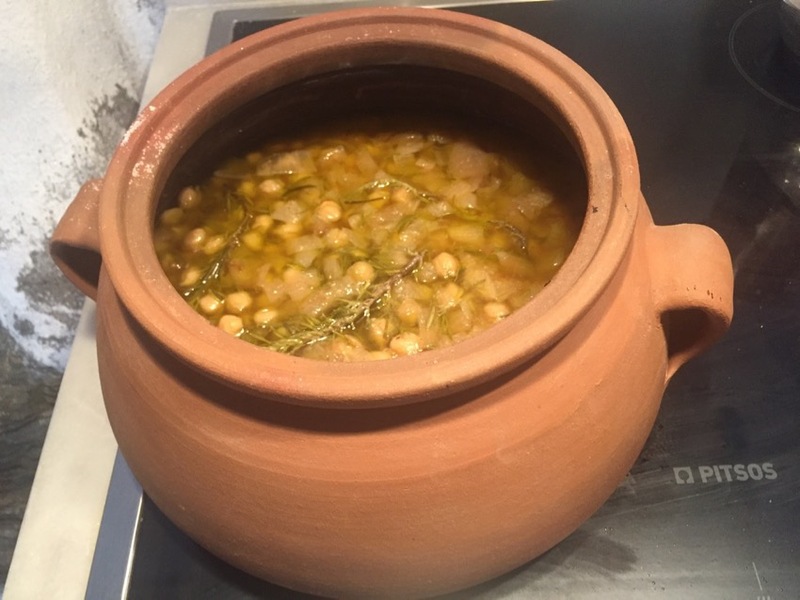 This is how I make it using a Sifnos mastela pot and when it is done it tastes the same as it does in Sifnos and sometimes even better. Cover the pot and put it in the oven and forget about it for 2 hours. You can also slow cook this at 250 for 8 hours or so. When it is done it should look like this. To tell you the truth after I cooked it for 2 hours they were still not as soft as I wanted so I put them back in for another hour. So you can cook them for 3 hours if you like. If there is liquid and they are covered they won't burn and the longer you cook them the better they taste. Anyway it should look like this and if you want Revitha Soup you can eat it now. But we are going beyond soup and into the world of science. Turn on a burner on your stove and put the pot on top and add one t-spoon of baking soda. Let it do its thing for one minute and then turn off the burner and let it sit for awhile. It is still really hot. The longer you wait to eat it the better it will taste and you won't burn your mouth either. When you put it into your bowl it should look like this. Add lemon and a little bit of olive oil for even more flavor. By the way it will be thicker and taste even better the next day. I usually make a lot more than this and eat it every day until I'm tired of it. If you put the mastela pot itself in the fridge to heat it up on the stovetop the next day my advice is to use another pot. I did this and heard a loud crack and my pot was broken. I had to go to Sifnos and buy another. If you like this recipe please share it with your friends. If you don't like it e-mail me and tell me what I did wrong. But mine always comes out good and it is such a simple recipe it is really hard to screw up.